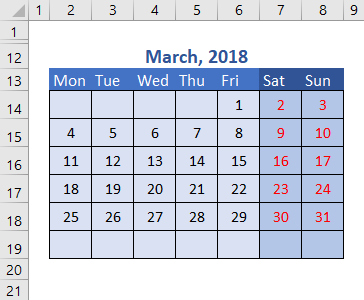 A screen shot of the calendar for March 2018 is shown in figure 2. This is needed in the following discussion because the image in figure 1 is dynamic. Excel OneDrive based files do not permit Form Controls, ToolBox, or ActiveX items. These features are available in the download version at the foot of this page. To setup the formulas manually, follow logic steps 1 to 11. See section 3 for VBA code to perform the setup (available in a later version). Returns the row number of a reference, or the first row number of a multi-row reference. When entered as an array formula with a multi row reference, ROW returns a vector of digits from the first row to the last.